I can't remember if Alexis and Dex were fighting at the end of the last episode. 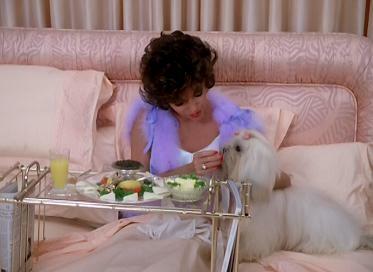 Oh wait, Alexis is feeding her dog breakfast in bed. That means Dex must have stormed off for some reason. Dex returns to Alexis's bedroom (there is no reason to call it their bedroom) and the two make up once again. Of course, they have not resolved their underlying issues, and it only gets worse. Why doesn't the pooch get some caviar. After Dex leaves, Alexis has a visitor - Sister Theresa. Now, if there is someone who could use the help of a nun, it is Alexis. Is Sister Theresa here to raise money for some orphans or the poor? No, she has a letter from someone in Moldavia claiming that King Galen is alive and that he can help get him out for $10 million. Now, all Alexis needs to do is to get into the country and get the $10 million to those who are requesting it. Alexis goes to Blake first for some reason, but Blake refuses to help. He will not risk the life of any man to possibly save the life of King Galen, who may already be dead. Maybe King Galen's son, Michael, will help. Of course not. Michael is pretty much a waste and has been nothing but insufferable to those around him, particularly Amanda. Just give that boy a throne and that will stop his whining. Alexis has no other choice but to turn to Dex. Dex is not thrilled, especially since he knows that King Galen is Alexis's first love. Funny, I thought it was Blake. Alexis has so many first loves, it is hard to keep track. Dex is a specialist in these kinds of missions and Alexis calls him out for his jealousy. Fine, Alexis will do this on her own. Dex tells Alexis that if she goes to Moldavia their marriage is over. Alexis is fine with that. Of course, the two make up and Dex promises to help Alexis rescue the King, but Alexis must do exactly as Dex commands. Yeah, that will happen. In San Francisco, Adam once again asks Claudia to marry him but she shuts him up. Why not enjoy the sites of the city? While at lunch, Claudia is making out with some stuff animal that Adam won for her and she notices some guy in a scarf staring at them. The scarf thing makes this guy look kind of gay. Anyway, the man with the scarf is following Claudia and Adam everywhere they go and Claudia is scared. Adam takes her onto a boat and the guy with the scarf reveals himself - he is a priest prepared to marry Adam and Claudia if they are willing. Claudia finally succumbs to Adam's several requests. You know who else proposes? Miles. The proposal was very casual as the two are sitting at a bar. Miles offers Randall/Fallon pretzels, peanuts, olives and then marriage. Randall/Fallon politely turns Miles down since she needs to know herself first. Miles is pretty cool with it. That is so unlike Miles. Later, the two are at some antique shop and Randall/Fallon takes a liking to some toy carousel. We all know what is going to happen. The toy reminds Randall/Fallon of the time she had severe headaches on a carousel. (This time re-shot with Emma Samms). Randall/Fallon does not want the toy. Jeff feels that Aunt Connie's gift is proof that Fallon is still alive and in Los Angeles. He is excited for the challenge and to find Fallon. As Jason's partner, Jeff can keep an eye on Jason and be a man that Blake can trust with respect to the Carrington-Colby pipeline. Thus, Blake accepts Jason's proposal. Before leaving, Jeff tells L.B. that they will be moving to California but that Jeff needs to go ahead to find a place to live. In the meantime, Krystle will take care of L.B. I wonder if Rita realizes that she will soon be taking care of L.B. Sammy Jo is being rather nice to Krystle and of course Blake and Krystle are oblivious to Sammy Jo's change. Sammy Jo just wants to get Krystle in public so Joel can film her and teach Rita how to carry herself as Mrs. Blake Carrington. Rita, who now looks like Krystle, is starting to get the hang of being Krystle. The plan is to switch Krystle with Rita at some ball. Now, all that is needed is to get a copy of the gown that Krystle will be wearing. Sammy Jo tries to get the designer to make a second one, but the designer, Mr. Beaumont, would want to ask Krystle first. Well, Krystle arrives at that moment. Perfect time to ask. Krystle is flattered but does not think the gown will work for Sammy Jo, but she will think about it. Krystle decides, instead, to copy another gown for Sammy Jo and goes out to Delta Rho to show Sammy Jo the dress. You know what is going on at Delta Rho, Joel's coaching of Rita. Why didn't they decide to do this in a hotel just in case Krystle may show up because she does have a history of doing so without calling? Krystle shows up with the gown and sees Rita. Rita looks like a deer in headlights and Krystle decides to call Blake, for some reason, so that Rita can explain things to him. As Krystle is on the phone, Joel enters and knocks her out (how he did that since he tapped her on the back). Well, no need to wait for the ball for the switch, Rita needs to be ready to go because she is now Mrs. Blake Carrington. Alexis: Good morning, did you sleep well. Dex: As a matter of fact, no. And, I bet neither did you. Alexis: I slept like an angel.